An 18-year-old man led police on a high-speed chase down Fletcher Bay Road early Tuesday morning. The pursuit ended when his car plunged down a ravine at the intersection with Lynwood Center Road. The man was arrested for drunken driving and attempting to elude police. Also this week, police arrested a 44-year-old woman for driving a van with stolen plates and a 24-year-old woman for slapping her boyfriend outside the police station. UPDATE: Apparently Hansen wasn’t done yet. Here’s his op-ed published Tuesday in the New York Times. Wednesday marks the 50th anniversary of the March on Washington and Martin Luther King, Jr.’s transcendent “I Have a Dream” speech. As the occasion approaches, media outlets across the country are striving to place the historic day in context. 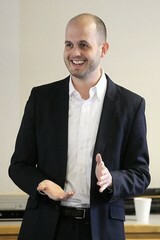 For help, some are turning to islander and state legislator Drew Hansen. Few people are as intimately familiar with King’s speech as Hansen. The Bainbridge lawyer and 23rd District representative is also author of “The Dream: Martin Luther King, Jr., and the Speech that Inspired a Nation,” a study of the meaning, context and legacy of the famous oration. “The Dream” was published by Harper Collins in 2003 coincide 40th anniversary of the March on Washington. Hansen became a popular guest speaker after the book’s release, giving numerous talks on King and the speech over the last decade. As the 50-year anniversary of the march approaches, he is once again sharing his insights. As promised, new City Manager Doug Schulze has made public outreach a priority. City Hall has taken gradual steps to up its web presence over the last year, including the launch of a city manager Twitter account this week. It’s also experimenting with new online tools for residents. The city is now on Facebook and on Twitter. Schulze sends out a weekly city manager’s report via email (sign up here). It’s become useful resource for staying on top of city news. Customers can now pay fees for utilities and licenses on the city website. The police department posts monthly crime statistics online. Police also send out text and email alerts via Nixle (this system has been in place for more than a year now, and seems to work well). Public works utilizes a system called SeeClickFix (sample pictured below). It allows residents to use their mobile devices to report hazards like oil spills and potholes, and track the city response. More improvements are on the way. Schulze is putting the finishing touches on a communications plan to present to the City Council soon and expects to launch a new city website in late November. A Bainbridge man called police after two suspicious men followed him while he walked to the ferry on the morning of Aug. 15. One of the men was carrying a baseball bat. Police located one of the suspects who explained that people had been “creeping” around his house and he and a friend were checking the neighborhood. Also this week, a California man was airlifted after flipping his car off Highway 305, and an employee of a Hildebrand Lane business used a steak knife to make a point. Farmer Akio Suyematsu left an indelible mark on Bainbridge Island’s agricultural community. The Japanese-American berry grower passed away last year at age 90, but his legacy lives on through the generation of farmers he mentored in his Day Road fields. The city declared Aug. 19 “Akio Suyematsu Day” following his passing. Islanders will mark the occasion Monday with a celebration at Suyematsu and Bentryn Family Farms on Day Road East (the driveway by the farm stand). The event will include a walking tour, live music, locally-grown food and refreshments, and a memorial display. The celebration is scheduled for 6-9 p.m. Above, Akio Suyematsu in 2007. Photo by Carolyn J. Yaschur. Long awaited repairs on crumbling Rockaway Beach Road will begin next week, accompanied by a road closure. A traffic detour will be in effect for the duration of the stabilization project, according to a Wednesday bulletin from the city. The city expects the road to be closed near Creosote Lane from about Aug. 21 through the end of November. A map of the detour route is below. More updates are available on the Rockaway Beach project page. Composer and musician Jherek Bischoff has played concerts at some of the nation’s most venerable venues (Lincoln Center most recently). But he’ll give one of the most meaningful performances of his career Friday at Bainbridge Performing Arts. The island concert marks a homecoming for Bischoff, who first took to the stage in Bainbridge High School and BPA musicals. Since then he’s released an acclaimed album of orchestral music and toured internationally. 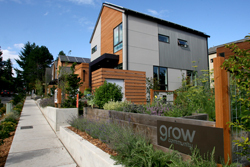 Bainbridge Island’s public works director vacancy is now being advertised nationally. Requirements for the public works position include at least eight years of experience in public works, a bachelor’s degree in engineering (master’s preferred), and a professional engineer’s license. The salary will vary depending on the applicant’s qualifications. Former Public Works Director Lance Newkirk earned $131,000 a year. Newkirk announced his resignation in April, but only recently left the city’s payroll. The city hired John Cunningham as an interim public works director at a rate of $100 an hour. The deadline for applications is Sept. 3. A 21-year-old Bainbridge rider was reportedly giving the finger to the driver of the car ahead of him July 30 when his motorcycle crashed on Blakely Avenue. The rider claimed the car slowed sharply, causing him to clip its bumper and lose control. Police suspected the rider’s alternative use of his braking hand may have contributed to the wreck. Also this week, vandals destroyed a sign at the Japanese American Exclusion Memorial, and a deer-shaped archery target lost its head. 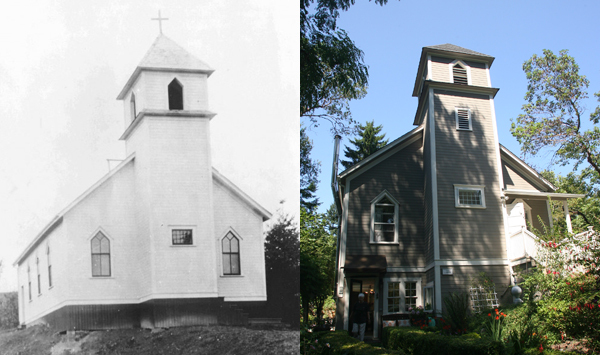 Photo on left courtesy the Bainbridge Historical Museum; photo on right by Tad Sooter. 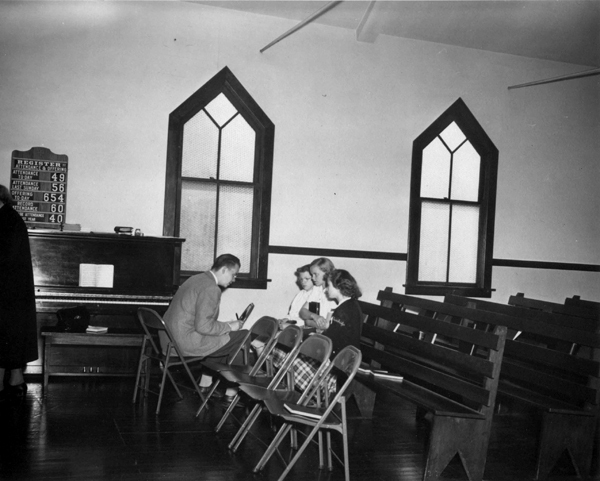 Bainbridge Island’s Bethany Lutheran Church is marking its centennial this year. 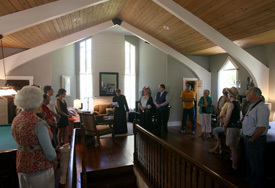 As part of the celebration a group of congregants spent Sunday afternoon revisiting the original Bethany Lutheran, a 1913 church house on Pleasant Beach Drive. There are still a number of Bethany Lutheran members who attended the old church (Bethany relocated to Finch Road in 1961). Some were baptized there, confirmed there, and even married there. Today the church is a private residence. 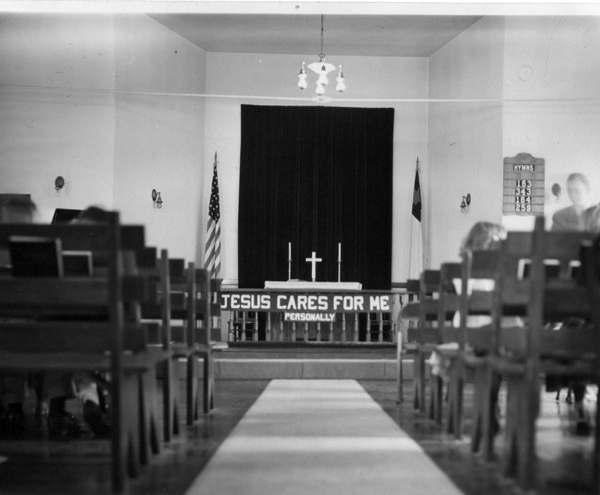 Shirley Jenkins (formerly Ostrand) recalls when her extended family filled several pews at the Pleasant Beach church. In the early days the Ostrands drove a horse cart south from their Manzanita homestead to attend services. Pulitzer Prize and National Book Award-winning poet Theodore Roethke died in a swimming pool on what is now Bloedel Reserve on August 1, 1963. Oddly enough, the reserve is throwing a sellout garden party this evening. It’s doubtful Roethke’s name will receive official mention. There’s nothing marking the spot where Roethke died of an apparent heart attack while visiting his friend, Prentice Bloedel, the son of a Northwest timber baron. The pool was filled in after Roethke’s death and is now the reserve’s popular zen rock garden (above). For more on Roethke, head over here.